Across immigration, policing, criminal justice, and voting rights, the attorney general is pushing an agenda that could erase many of the legal gains of modern America’s defining movement.
. . . the Sessions Doctrine is the endgame of a long legal tradition of undermining minority civil rights. For Paul W. Schmidt, former chairman of EOIR’s Board of Immigration Appeals from 1995 to 2001 and a former EOIR immigration judge, the immigration system has always been vulnerable to naked political plays by the attorney general, but Sessions has so far been the boldest in making such plays. EOIR is “a division of the Justice Department, which is ridiculous,” he says. According to Schmidt, the recent moves on immigration reflect a broader set of priorities that share several common threads. “He’s abandoned prison reform,” Schmidt says. With that, the DOJ set the course for an approach to law-and-order that relied more heavily on incarceration, one that pays little attention to data and statistics, and even less attention to the voices of the communities most in need. This portrayal of the current executive line as a hindbrain-level reaction to even the slightest whiff of the White House’s previous occupant makes sense, and is probably the only way to consistently interpret Trump’s wildly impulsive policy gesticulation. But just as Obama himself is tied to a deeper tradition of racial discourse and civil rights in this country, so is his backlash. The history of voting rights and desegregation in America over the past 50 years—from the civil-rights movement through the Supreme Court’s 2013 Shelby County v. Holder decision, which gutted a key provision of the Voting Rights Act—might be told well by the story of Alabama alone. It is a story in which Sessions’s own career is rooted, and one in which he’s played a central role over the past few decades. Sessions and the DOJ defended his prosecution with the charge that he’d actually protected the voting rights of black belt citizens against three potential fraudsters. Sessions always maintained that he should’ve won the case. “I guarantee you there was sufficient evidence for a conviction,” he said after the trial. Still, the prosecution that Turner described as a “witch hunt” made enemies of none other than Coretta Scott King, the civil-rights activist and widow of Martin Luther King Jr., who submitted a letter opposing Sessions’s 1986 nomination to the judgeship of the court for which he served as attorney. [Coretta] Scott King wrote: I urge you to consider carefully Mr. Sessions’ conduct in these matters. Such a review, I believe, raises serious questions about his commitment to the protection of the voting rights of all American citizens and consequently his fair and unbiased judgment regarding this fundamental right. When the circumstances and facts surrounding the indictments of Al Turner, his wife, Evelyn, and Spencer Hogue are analyzed, it becomes clear that the motivation was political, and the result frightening—the wide-scale chill of the exercise of the ballot for blacks, who suffered so much to receive that right in the first place. Attorney General Jeff Sessions has rolled back the policies of his predecessors, Eric Holder and Loretta Lynch. 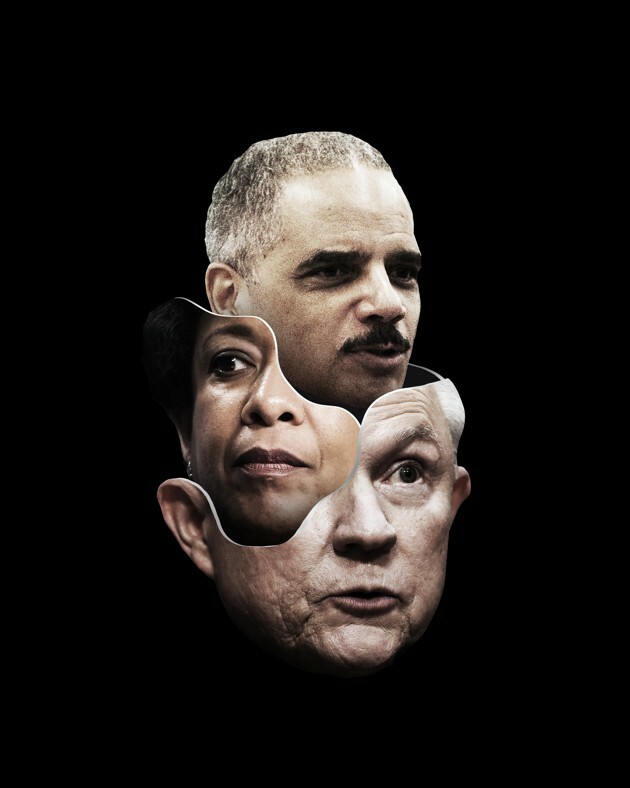 While Barack Obama’s civil-rights and civil-liberties legacy is more than complicated as a result of his foreign-policy and domestic-surveillance records, his Justice Department was built with the heritage of aggressive civil-rights enforcement in mind. Notably, Obama’s first assistant attorney general for the Civil Rights Division, Tom Perez, had worked for years as a federal prosecutor of hate crimes. Perez’s boss at the time, Attorney General Eric Holder, testified twice in favor of anti-hate-crime legislation passed in memory of Matthew Shepard and James Byrd Jr., two men killed in separate hate-related incidents in 1998. According to Sherrilyn Ifill, the president and director-counsel of the NAACP Legal Defense Fund—and an active litigant in several voting-rights cases—the Sessions era, while brief, is unprecedented. “Let’s start with voting,” Ifill told me. “The Department of Justice has essentially abandoned that area of civil-rights enforcement, even in the cases in which they were present, such as the Texas voter-ID case, in which we were co-counsel.” Among a civil-rights enforcement ecosystem that has already had to adjust on the fly to the loss of judicial and DOJ preclearance of state- and local-elections laws after the 2013 Shelby County v. Holder decision, the Justice Department’s withdrawal from its voting-rights docket basically creates a massive vacuum, one ripe for exploitation in the 2018 and 2020 election cycles. Whether Sessions himself will make it to the 2020 or even the 2018 elections is still anyone’s guess. The Russia investigation is ongoing, and every day it chafes a president who could fire Sessions. But the core irony in the acrimony between Trump and his attorney general is that Sessions—more so than just about anyone else in the Trump administration—has faithfully and skillfully executed the president’s policy agenda. He’s doubled down on “tough on crime” policies, sought to punish drug dealers, surveilled fierce critics of police, deflated the bipartisan movement for meaningful criminal-justice reform, supported voter-ID requirements, and used law enforcement and policy to build his own impediments at the border when Trump’s wall couldn’t find support. There has never really been a golden age for civil-rights protections. Each of the previous presidential administrations has failed in protecting some group’s rights, or actively violated others’. “But that’s completely different than an abdication of leadership in the civil-rights base entirely, and that’s what we’re facing,” Ifill continued.